Six competitors took part in the Shark-Free Challenge this week. CCFC newcomer Grant Wang joined the field of regulars. Although rated just below 500 the other participants were wary of him, and reasonably so. Grant had only played two prior tournaments and more recently had some impressive results, defeating a 1700 at his last event just a couple of weeks prior. However, fate was not on his side today as he lost in the first round to Ellen Rosenfeld. 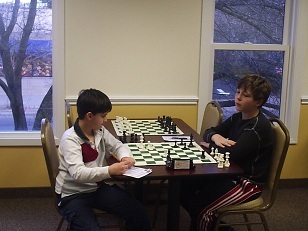 Rosenfeld then fell to middle-schooler Evan Helman in the second round. Going into the final round only Helman had a perfect score with CCFC Dream Teamer Matthew Lutjen Weinstock the only one left in his way. It was a tense battle as Helman won some material early on. Weinstock put up great resistance, but Helman was able to successfully navigate the complications that arose and brought home the full point. With this win, Helman won clear first with 3/3, a point ahead of Rosenfeld and Wang who had staged an impressive comeback.